With the busy convention and trade show season of the spring, it’s never too early to start planning your attendance at the Sprayfoam Show – SPFA’s Annual Convention and Expo! 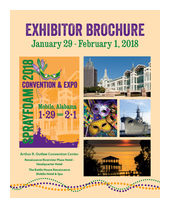 SPFA will be hosting the show for a growing and engaged number of attendees at the downtown Mobile, Alabama Convention Center, January 29 – February 1, 2018. SPFA Industry Excellence Awards Program Submissions are Now Open! On January 31 2018, SPFA will sponsor the Industry Excellence Awards Luncheon as part of the 2018 Sprayfoam Convention & Expo. There will be awards in several categories for projects that demonstrate excellence in our industry. A panel of industry experts will adjudicate the selection process through a blind judging process. Judges will not know to whom each of the entries belong, therefore the judging will be solely based on the merit of the project according to awards guidelines. To submit a nomination, or to learn more about creating a submission visit our nominations page. Effective September 29, 2017 Carlisle Construction Materials, LCC (CCM) has signed an agreement to purchase Accella Performance Materials (including all companies within Accella Performance Materials). We expect the purchase to be complete by the end of October. The attached press release provides additional details. Accella will operate as a separate and highly collaborative division within CCM. Icynene U.S. Holding Corp. ("Icynene") and Lapolla Industries Inc. ("Lapolla") (OTCQX: LPAD) today announced that they have entered into a definitive merger agreement under which Icynene will acquire all the outstanding shares of Lapolla. The transaction is valued at approximately $160 million, including net debt. The use of spray polyurethane foam in insulation applications continues to surge. As a high-performance material for the envelope, SPF provides superb energy efficiency, reducing heating and cooling demands up to 40 percent, while delivering the notable energy savings over the life of the structure. Additionally, the spray-applied material is notable for its ability to enhance indoor comfort and air quality, maintaining uniform indoor temperatures and preventing a wide variety of air contaminants from entering the structure. In a staggering statistic, nearly 26 million Americans suffer from asthma, including more than 7 million children. The chronic, often lifelong disease is not only serious, but can actually be life threatening to many. Those unfortunate to suffer with asthma can be affected daily by both natural and manmade triggers, which make breathing more difficult. Many of us assume that the majority of these triggers are encountered outdoors, but they are in fact often airborne and can (and do) infiltrate homes causing problematic and dangerous asthma attacks inside. A high-performance building envelope material. Sprayed polyurethane foam (SPF) is increasingly used in commercial structures as an insulation and air barrier. Sprayfoam is playing a growing role in sustainable new construction, energy-enhancing retrofits, and even the net-zero energy movement. October 9, 2017 - Today the Spray Polyurethane Foam Alliance (SPFA) and the ACC-CPI Spray Foam Coalition (SFC) published their new guidance document entitled "Spray Foam Insulation and Termites". This document was developed by a collaborative effort through a termite task group within SPFA's Building Envelope Committee and the SFC's Research Workgroup. This document addresses questions pertaining to inspection for, and treatment of, potential termite infestations in buildings using SPF insulation. It provides basic information about termite identification, inspection and treatment methods as well as discusses the important of air-sealing and insulation of critical areas using SPF. It also presents code-compliant solutions to address these concerns. This document can be downloaded from the SPFA website at no cost, click the link below. The Spray Polyurethane Foam Alliance (SPFA), the premiere 501(c)6 professional trade association and voice of the Spray Polyurethane Foam (SPF) insulation and roofing industry, participated in the 20th Annual Congressional Renewable Energy and Energy Efficiency Expo. The event was held across three rooms in the US House Rayburn building in Washington DC, two dedicated exhibit rooms and one dedicated to a variety of panel sessions that took place throughout the day. It brought over 40 exhibitors together representing the leading voices in energy efficiency, renewable energy, and net-zero energy for a day of celebration of the principles, efforts, plans and dedication to the energy generation and use in our future-United States. SPFA, along with several other building insulation trade associations, is participating in a workgroup led by UL Environments to update the Product Category Rule (PCR) for Building Envelope Thermal Insulation in North America. A PCR is an consensus guidance document used to develop Environmental Product Declarations for a specific class of products (in this case all building insulations). We are seeking member volunteers (interested parties) to review this updated PCR during the next several months. Volunteers from all SPFA membership categories are encouraged to participate, as this document includes assessment of the environmental impacts of insulation from all phases of the product life-cycle, including the extraction and processing of raw materials, chemical blending, packaging, distribution, installation and disposal. If you are interested in participating, please contact Rick Duncan at rickduncan@sprayfoam.org. A task group within the SPFA Roofing Committee has completed the development of a new SPFA TechDoc for installation of SPF Roofing with roof-mounted photovoltaic (PV) systems. This new document provides an introduction to PV technology, design considerations, service and maintenance, warranty questions, applicable codes and standards and an overview of mounting options. The self-flashing properties of SPF roofing systems, along with superior energy savings, make SPF an excellent choice as a roofing system for any type of roof-mounted PC system. Free copies of this new TechDoc are available here. For questions or comments about this document, please contact Rick Duncan, SPFA Technical Director at rickduncan@sprayfoam.org or call 703-222-4269. SPFA-127 SPF Roof Systems Maintenance Manual has been updated by a Roofing Committee task group. The reorganized document contains improved photos and updated guidance to help customers and contractors get the most out of their SPF roof system. SPF roofing contractors are encouraged to share this with their customers. Many thanks to the task group for working diligently over the past year to deliver this important update. The group was led by Robb Smith and included the following volunteers: Bruce Schenke, Roger Morrison, Jason Hoerter, Chris West, Jack Moore and Jim Andersen. For more information, contact Rick Duncan SPFA Technical Director rickduncan@sprayfoam.org or Bruce Schenke, SPFA Roofing Committee Chair bschenke@accellapolyurethane.com. Fall Issue of SPRAYFOAM Professional Magazine is Here! The fall issue of SPRAYFOAM Professional has been mailed and emailed! If you didn't receive it in your inbox or mailbox and would like to be on our email list to receive the digital link, sign up here. Be sure to read this quarter's feature article, "An Expanding Business: Spray Foam Offers Interesting Opportunities for Sidelines," which discusses the variety of opportunities that sprayfoam has for different businesses. Read all of this and more in the summer Issue of SPRAYFOAM Professional. PCP is please to announce that Field Exams will be FREE during Sprayfoam 2018 in Mobile, AL. This is possible due to the generous donations of the Sig Hall Memorial Scholarship Sponsors (This list is as of 10/30/17). The Field Exams will be held on Monday-Tuesday, January 29-30, 2018. SPFA thanks all of our sponsors for their generous support of the Professional Certification Program. Their generosity makes becoming certified affordable for contractors! Registration is not open yet, but when it is, we’ll send notice out through this newsletter and other channels. You may keep checking www.sprayfoam.org/expo for all the latest convention updates. If you have any questions, please contact Kelly Marcavage at certdir@sprayfoam.org. The SPF Assistant is the entry level to the PCP program. Everyone needs to demonstrate they have the knowledge of the Learning Objectives covered in the SPF Assistant Exam Preparatory Course to become PCP Certified at all levels. This course lays the foundation in the basics of SPF chemistry, chemical health and safety and job site safety. Topics include equipment and job set-up, substrate preparation, material handling and staging, moving of hoses/scaffolding/ladders, masking, trimming, clean-up and other non-spraying tasks. Everyone on the job site needs to know the important areas covered in this course. The SPF Assistant is the first level for both Insulation and Roofing. NOTE: You’ll have 90 days to complete the course after you register and you may stop/start/repeat it as often as you would like. Join the ranks of these 2018 Field Exam Scholarship Sponsors. Their generous donations help offset the cost of field exams for SPF contractors seeking the SPF Master Installer Certification. Our goal is to make the Field Exams offered during the SPFA Convention FREE, but we can’t do that without your support. 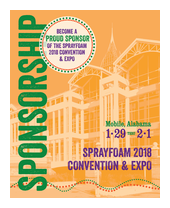 We’ve just begun reaching out for sponsors, and these companies have already committed their support for the Field Exams to be held during Sprayfoam 2018 in Mobile, AL. We hope to add you to this list soon! We need at least 10 more companies (14 total). It is through their generosity that FREE (or reduced fee) Field Exams are available. Click here for the list of 2017 Field Exam Sponsors. 1) Your logo prominently displayed on Field Exam Flyer. You must REPLY BY October 16, 2017 in order to have your logo printed on 2018 flyer! 6) Table top, easel backed sign which reads "Proud Sponsor of the Sprayfoam 2018 SPFA PCP Field Exams"
For more details, contact Kelly Marcavage, SPFA Certification Director at certdir@sprayfoam.org or call 571-748-5003. Sprayfoam 2018 Convention. We discussed general plans for 2018, now the Working Groups handle the details. This responsibility of this Working Group (WG) is to make the Field Exams happen. The participants take responsibility for different stations, provide personnel and materials, equipment and supplies necessary. Several SPF Suppliers have already agreed to become Sponsors by donating some of the material and equipment needed, but many other items, personnel, including Field Examiners are still needed. The responsibility of this Working Group (WG) is to raise the scholarship funds to either offset or reduce the cost of the Field Exams for participants. In addition, this WG is charged with "filling the seats" of the Field Exams through the development of a Field Exam and PCP promotional flyer and other the use of other marketing techniques such as phone calls, email blasts and general promotion of the PCP opportunities at the Sprayfoam 2018 Convention and Tradeshow. We already have a few scholarship sponsors but we’ll need a lot more to cover the total cost of Field Exams for the contractor candidates. If your company doesn’t have the time/people to participate in the WG, it is still possible to become a Scholarship Sponsor. Please reply SOON to maximize the promotional opportunities. All those who commit by October 20 will have their logo appear in the Field Exam Promotional flyer. NOTE: ALL FIELD EXAM SPONSORS WILL HAVE THEIR LOGO USED AS APPROPRIATE IN SPRAYFOAM 2018 PROMOTIONAL MATERIAL, SPFA WEBSITE AND IN ON-SITE SIGNAGE. As part of the curriculum review, the PCP Training Committee recommended adding information on Polyureas to the Roofing Installer Curriculum. The reason is to align PCP with the SPFA Technical Document #102. The QAP agreed and has approved these Learning Objectives. This information on Polyureas will be in the Coating and Application Section of the Roofing Installer Study Guide(Section J). The Certification Scheme Committee (CSC) has developed at least one accompanying question for each of the Learning Objectives. These questions will be added to the Roofing Installer bank of questions and will be randomly selected for future written exams. These questions will not be added until the updated SPF Roofing Installer Study Guide is released and all candidate and certified individuals made aware of addition. When it is released, all registrants in the PCP will be sent the updated information on Polyureas. Until that time, no changes will be made on the Written Exams. In its work to continually improve the PCP, the Training Committee reviews SPFA Study Guides. SPFA Members are welcome and encouraged to join the Training Committee to assist in this task. If you are interested, please contact Kelly Marcavage at kmarcavge@sprayfoam.org. ATTN: Field Exam Equipment/Material Sponsors -- set up begins on Friday, January 26, 2018. All written exams are available for each level of certification. Check back to website for more details as we get close to the dates of the convention at www.sprayfoam.org. Continuing Education Units (CEUs) are required for RECERTIFICATION in the PCP when you’ve completed your 7th year as a certified individual in the SPFA Certification Program. The individuals who were certified first will need to recertify by December 31, 2019. Although that is far off with plenty of time to meet the CEU requirements, we encourage you to download and save this attached form and fill it in with courses you’ve taken since you entered the program. If you’ve attended one of the SPFA Foam-It-Right webinar series, be sure to list them. If you missed a webinar, you can listen to a recording of it (and still get CEU credit!). Go to the SPFA Member page on our website to access the webinars. If you aren’t a member, but you are enrolled in the PCP, you can also attend these webinars and access recordings, please contact Kelly Marcavage at kmarcavage@sprayfoam.org for details. For those who have attended SPFA convention since you’ve become certified, you can access a list of all the breakout sessions from previous conventions to help you remember the ones you attended. We have registration records indicating that you’ve attended the convention; however, this process is self-reporting so you’ll need to complete the form and submit when you’ve met the required number of CEU. In addition to these SPFA opportunities for CEUs, there are many other ways to earn them. See the attached CEU Declaration Form (F-222-130) for more details. It is easy to download form, fill in what you’ve done so far and just update it as you earn other CEUs. When you’ve met your requirement, please submit! To locate these pages, simply go to www.sprayfoam.org/certification and click on the "Certification" tab. From the drop-down menu, you may select the page you would like to view. We also have the bilingual forms and Agreement posted. These are in the process of being updated to reflect the modifications to the program, but the best place to find all the forms you need is our website. If you have any questions about the SPFA Professional Certification Program (PCP), please contact Kelly Marcavage at kmarcavage@sprayfoam.org. The committees comprising the SPFA PCP are working to continually improve the certification program. Just an hour before this print deadline, the Quality Assurance Program (QAP) Committee unanimously approved the recommendations of the Certification Scheme Committee (CSC), which would streamline the certification process and removing redundancy of requirements. Our membership directory is going to print in June 2017. In order for your company’s accreditation or individual PCP Certification to be highlighted in the directory, you must meet all accreditation requirements! Like last year, each member company who employs SPF PCP Certified professionals will be identified (*) in the SPFA Membership Directory and Buyer’s Guide – but you MUST be current and certified in June 2017 to be listed. If you received your accreditation and certification credentials in 2017 with a deadline of December 31, 2017, then you are current and will be listed! Please contact Kelly Marcavage to check your status at kmarcavage@sprayfoam.org. The PCP Training Committee will be reviewing the SPFA PCP Study Guides. Working Groups will be formed for each Study Guide and your expertise would be greatly appreciated. If you are interested in assisting on this project, please email Kelly Marcavage, SPFA Certification Director, at kmarcavage@sprayfoam.org. We are looking at data showing that many folks have successfully completed some of the requirements needed to become SPFA PCP Certified; however, they haven’t submitted all the information needed to earn the distinguished SPFA PCP Certification. A Working Group is being formed to reach out to those who have begun, but not yet completed certification levels. We’d like to hear from you on what is stopping you from completing the requirements. This same group will also work on retaining and renewing those who are already certified and helping them get to the next level! In 2012, OSHA began a program to align the old Hazard Communications Standard (HCS) with the new Globally Harmonized System of Classification and Labeling of Chemicals (GHS). https://www.osha.gov/dsg/hazcom/ This new system to be implemented over the next several years, includes updated methods to communicate hazards on product labels and safety data sheets using an international standard. OSHA has released a new fact sheet explaining how the agency’s Confined Spaces in Construction standard affects common spaces in residential construction, such as attics, basements and crawl spaces. The fact sheet, developed after consultation with the National Association of Home Builders, and a detailed Frequently Asked Questions document, clarify some of the standard’s provisions and their application to residential construction work. Installing a new roof or repairing/replacing an existing roof can be significant expense for homeowners and business owners. In partnership with the Insurance Institute for Business and Home Safety, RICOWI (Roofing Industry Committee on Weather Issues) has published a new guidance document, developed by roofing experts, to help property owners, as well as inspectors, code officials, roofing consultants, roofing contractors and insurance professionals determine when roof replacement or repair is necessary. The SPFA Roofing Committee formed a task group led by Roger Morrison to develop and review content related to spray foam roofing systems. SPF contractors can use this free guide to help with discussions with their customers. For more information contact Rick Duncan, SPFA Technical Director, at rickduncan@sprayfoam.org, or Bruce Schenke, SPFA Roofing Committee chair. Lapolla Industries, Inc. announced its financial results for the second quarter of 2017. Financial highlights from Second quarter 2017 compared to second quarter 2016: net income increased by 29.4 percent, exceeding $2.15 million, spray foam sales increased 33.2 percent and overall sales increased by 30.7 percent, exceeding $26.25 million in revenue and gross profit increased by 12.4 percent to $6.87 million. Accella Polyurethane Systems LLC ("Accella") renews their focus on Polyurethane Spray Foam and Roof Coating Systems; focusing on low slope and flat roof commercial coatings for new and restoration construction. SprayWorks Equipment Group has launched a new online store, complete with a fully responsive website to help with consistency between different devices and a fully searchable mobile view. In addition to the new store, SprayWorks is also offering special discounts to celebrate. Honeywell announced that Eric Gladson of Integrity Plus Insulation in Ogema, Wisconsin, is the Grand Prize winner of the "Hit a Foam Run" promotion. Gladson wins an all-expenses paid trip for two to the Professional Baseball Game of Stars in Miami, July 2017 ($7,000 estimated value). Firestone Building Products Company, LLC (Firestone) today announced its acquisition of Gaco Western (Gaco), a leader in innovative silicone roofing systems and provider of top-tier waterproofing and spray foam insulation. Tenex Capital Management is pleased to announce it has completed an investment transaction in SES Foam LLC of Houston, TX, effective on September 9, 2016. ASTM International has, under the leadership of SPFA’s Dr. Duncan, SPFA members and SPF industry professionals, announced the completion and approval of a new standard entitled Standard Practice for Installation of High-Pressure Spray Polyurethane Foam Insulation for the Building Enclosure. This practice covers the installation of high-pressure spray polyurethane foam (SPF) as an insulation for building enclosure assemblies including: walls, ceilings, attics, floors and crawl spaces. This practice does not apply to SPF used strictly as a component for an air barrier system or for SPF used in roofing applications. The Standard can be purchased by ASTM here. If you have any questions please direct them to Dr. Duncan. See what's in store, as far as industry events, expos, training classes, online courses, certification programs and more.